Telenor UP East Voucher Recharge Plans | Combo Voucher Recharges. Telenor UP East Voucher Recharge Plans Telenor UP East Voucher Recharge Plans are the plans provided for the customers of UP East state. 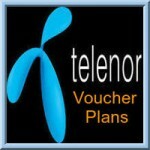 Telenor Voucher Recharge Plans consists of Combo Packs and Limited Period packs which are mainly about Voice packs. Each and every offer is updated daily on our website www.onlinerechargeplans.co.in. Voucher recharges just like discount … [Read more...] about Telenor UP East Voucher Recharge Plans | Combo Voucher Recharges.